The Toronto edition of Ming Pao Daily News, one of the handful of Chinese-language publications in the city, has laid off seven of its editorial staff and shipped their jobs to China, Epoch Times has confirmed with the union representing the newspaper’s employees. Simon Sung, president of Unifor Local 87-M, the employees’ union at Ming Pao, said the official date of the layoffs is Nov. 16, but a staff member of Toronto Ming Pao told Epoch Times that the seven editors have already left the company. Howard Law, the national representative of Unifor Local 87-M, confirmed that the work of the seven editors will be outsourced to a company in Guangzhou, China. This follows other rounds of layoffs at Ming Pao and another Chinese-language paper Sing Tao Daily in recent months. 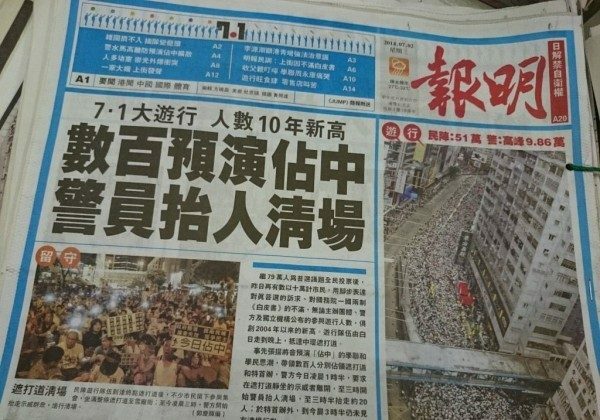 Ming Pao laid off all three of its photographers last July, and Sing Tao laid off eight full-time employees and transferred their jobs to Hong Kong last June. Sing Tao has had several other rounds of layoffs since April 2012, reducing its total number of employees to half. In all cases, the jobs have been shipped to the Hong Kong or mainland China branches of the company. A Ming Pao employee who wished to remain anonymous told the Chinese edition of Epoch Times that the seven staff that were recently laid off were all full time editors, and had been with the company for at least 10 years. With their departure, only two editors remain, the Toronto Chief Editor Guoji Wu and Toronto Deputy Chief Editor Junwu Wang. The Ming Pao employee said that the editorial work going to China presents an issue as there is no freedom of press in China. China scholars have cited Ming Pao and Sing Tao among the list of overseas Chinese publications under the control of Beijing. He Qinglian, a prominent Chinese author and economist, documented the Chinese regime began its attempts to control overseas media in the mid-1990s, starting with several Hong Kong-based Chinese language media, including Sing Tao and Ming Pao. “Since the Chinese communist government accumulated financial power through reform and open-door policy, it started to fund or directly establish the seemingly independent Chinese-language media, Chinese-language schools, and encourage establishment of all kinds of Chinese organizations, as main tools of overseas United Front Work Department,” she wrote in her paper. The United Front Work Department is a Chinese Communist Party organization that works to expand the regime’s control of overseas communities. The Jamestown Foundation researched and published a report on Chinese media in 2000 that revealed how media under the control or influence of the Chinese regime followed the Chinese Communist Party’s editorial line on sensitive topics. The head of Sing Tao, Charles Ho, is a member of the Chinese People’s Political Consultative Conference, a political advisory body in China which exclusively reserves membership for very close supporters of the Chinese Communist Party. Ming Pao is owned by Media Chinese International, a company headed by Tiong Hiew King, a Malaysian Chinese timber company owner who has a longstanding relationship with the Chinese regime and varied business interests in China. Sheng Xue, an award-winning Chinese-Canadian journalist and human rights activist, lamented the state of Chinese media in Canada in a previous interview. “Even though we are in Canada or Australia or Europe, most Chinese media are under the influence of the Chinese communist regime. This is a very sad reality,” she said. Ming Pao faced criticism in Hong Kong last year when it replaced the company’s main chief editor with Chong Tien-siong, a vocal supporter of the Chinese Communist party. The Chinese edition of Epoch Times is completely independent of the Chinese regime.